This week, I finally put down the crochet long enough to do some painting! I really had a lot of fun creating this piece. Although, I haven't decided if it's completed or not, because I still haven't named this piece yet. Usually something will "hit" me while I'm working on it. This is acrylic paint and graphite pencil on a 9X12 canvas. First, I sketched out my face and practiced shading. Working with graphite is so much easier for me than paint. I feel like I have so much more control. Sketches are fine, but I really wanted color! Hopefully over time and with practice I can become more comfortable with paint. girl is so much bigger so that's how she ended up on a larger canvas. My next plan is to try and create a smaller sketch for the smaller canvas. Finally, I added some of my crochet and tatting pieces. pieces for added texture and dimension to the collage. This is my first party since my big move to Washington! 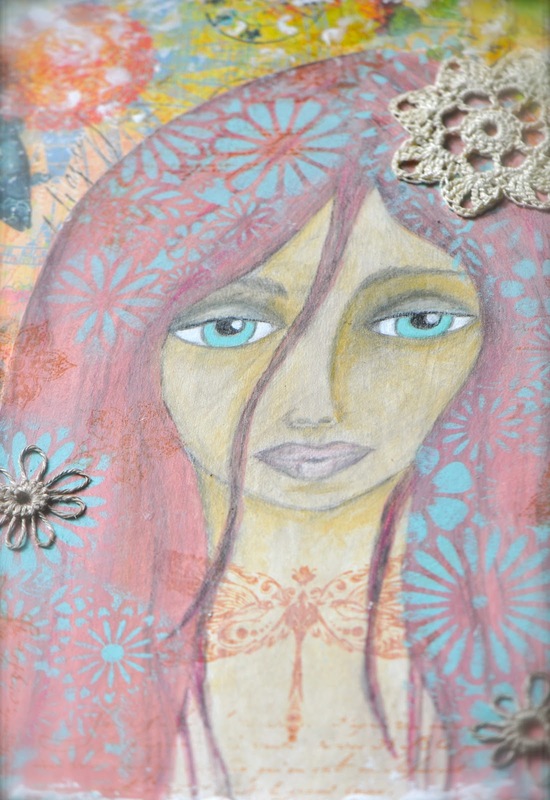 Do stop by to see what all the other party goers are creating...so much inspiration! watching them practice, and WOW...are they ever loud when they fly over so low! So, we'll be doing some "grilling and chilling" and enjoying the show. Absolutely beautiful. 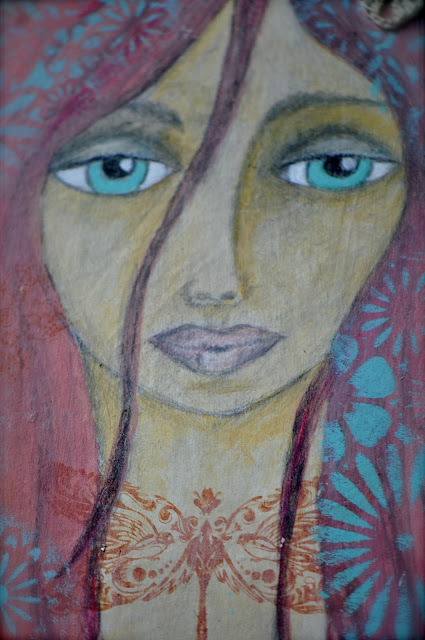 I truly love the way you mix textures and media. Gorgeous!!! I love the element on her neck. Love how you incorporated your passion for crochet into your painted portrait! Becca, I love what you have created, she is gorgeous. And the addition of textures like the crochet piece, very interesting. Is that a dragonfly stamp? I looooovvvve dragonflies. she's beautiful. i like it! Great textures, very pretty lady!|! This is so pretty Becca! 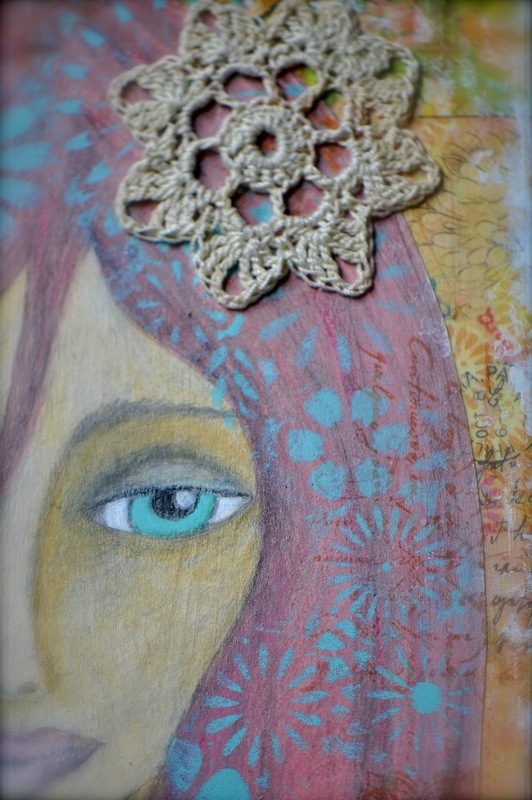 You layer colors and shapes so nicely in your art work and I love that you add your beautiful crochet to it! It's such a homey touch to the painting. Modern and old fashioned all at once. Hermoso trabajo! Me encanta tu estilo!.Saludos! Becca, this is just beautiful...I love how you work with paint...and the mixed media aspects are wonderful! You have so many talents, my friend! Sounds like a perfect way to spend the weekend! Nice spot for your pretty crocheted flowers, Becca! We might walk up the hill to see the Blue Angels; they flew over the house today and shook the rafters. Hope to see some of the Olympics synchro. swimming, too. This weekend and last are notorious for being nice which is great for the art fair and then Sea Fair. Enjoy! She's so beautiful! Love her dragonfly "tattoo" too! Wonderful piece of art! It reminds me my late brother, he is really good in painting,canvassing and drawing.Unfortunately, he died because of spray paint he uses in his paints. You're doing great..
What a sweet face. And I think the blue flowers over the red hair are the perfect touch. It's just great contrast. And yeah paints definitely take some time to get comfortable with so I know what you mean. But they're also too much not to invest the time in. Your girl is beautiful. I love how you added the flowers to her hair. It sounds like you are really enjoying your new home and city. I plan on starting a sewing project for my son's birthday this weekend. Keep at it Becca. She and the sketch are both lovely. The added texture is perfect. Wonderful piece! I especially love what you did with the stencil over her hair! She looks great.. Love the little crochet piece you added. Great work! Love the flowers in her hair! Hi Becca - love your painting. 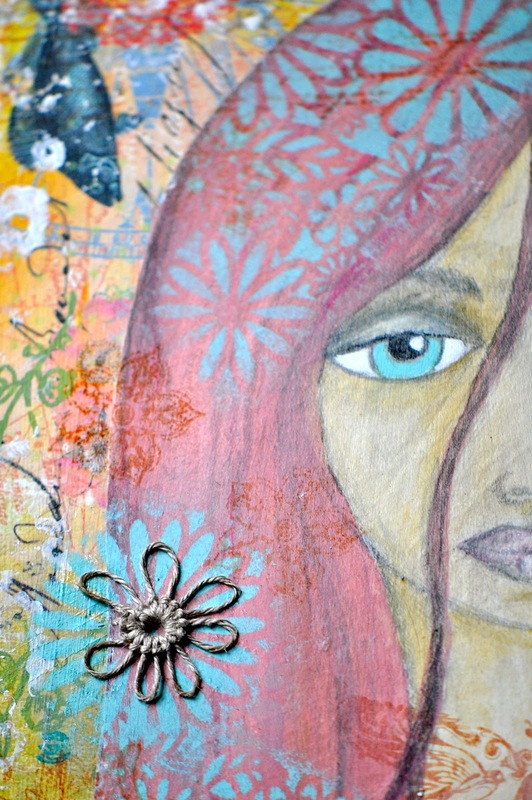 I like all the texture and colour overlayed on top of the painting. It is a fun, happy piece.